One Fish, Two Fish, Red Fish…what the #*@!? 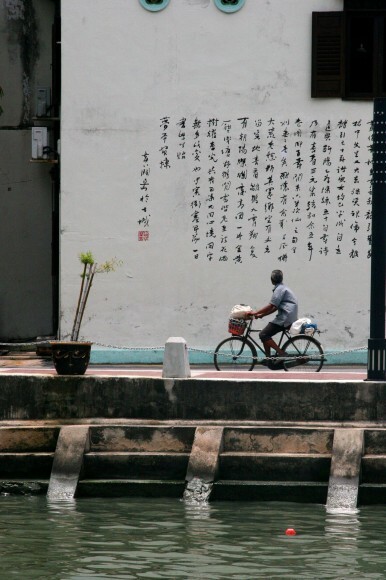 After a stifling day, young people loitered on the cement wall alongside the coast enjoying the sea breeze and eating take away from the bustling outdoor market just a parking lot away. Down below, a mess of boulders formed a wave break. Cats pounced between the rocks, unhindered by their strangely peculiar tails; some were stumps, others crooked, and a few with ends like a lollipop. I voiced my sad feelings about these cats a week earlier, happy to hear from a local that it was simply a “special Asian genetic defect”. Past the boulders, the tide was way out, exposing a wasteland of inaccessible coast; puddles of water and sticky ankle deep mud. Two Muslim tween-aged girls sat at the rocks edge, singing along to the streaming music on their phone. One girl casually passed a rock in her hands, finally tossing it in the mud. They exploded in a fit of giggles as mud speckled their faces and silky hijabs. We laughed along while our gazes shifted ahead. 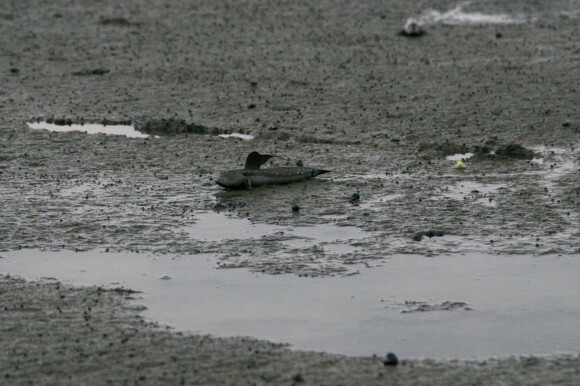 “Look at the fish flopping in the mud!” Brad said. It was truly horrible. This rather ugly fish, grey like the mud was so far from the water that there was no chance it would survive its own stupidity. Like staring into a Magic Eye painting, I was locked in a hypnotic spell, feeling saddened by this creature’s fate. 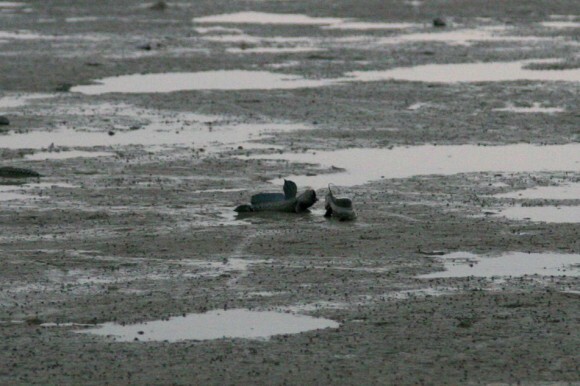 When my focus finally broke, I noticed I was actually staring out in a landscape of literally hundreds of fish flopping in the mud. How could it be that they all seemingly failed their natural instinct to follow the shifting waters back out to the sea? And then I noticed something even more surprising and unbelievable; using their pectoral fins, these fish were actually walking! I had never heard, let alone seen anything like it. I learned later after an obsessive internet search that this fish, the mudskipper, actually resisted being pulled back out to sea; hiding in seaweed and tidal pools until the coast was clear. At this point, their double life began. They are active creatures on land; walking in a series of skips (hence the name), feeding in the mud, interacting with others, defending their territory, and catapulting their muscular bodies up in the air. Much like a reptile, this amphibious creature breathes outside of water by expanding and retaining an air bubble in their enlarged gill chambers. It was really a sight to see. Eventually the sky darkened and we were forced to leave our rocky outpost. We wandered down the coast to the glowing canopy of a evening food market. What did we expect to eat at this food market? This in itself is the most exciting part about Malaysia: you never really know. Depending on our location, options vary greatly based on the mix of the three main ethnic groups in Malaysia. You may go to a market one day and find that it fully caters to the Chinese community, or head down another street and find it is halal food: acceptable for Muslim consumption, or perhaps entirely mamuk (also halal), a cuisine that has resulted from the intermarriage of migrating Indian Muslims and Malay women. Our options seemed to be endless. 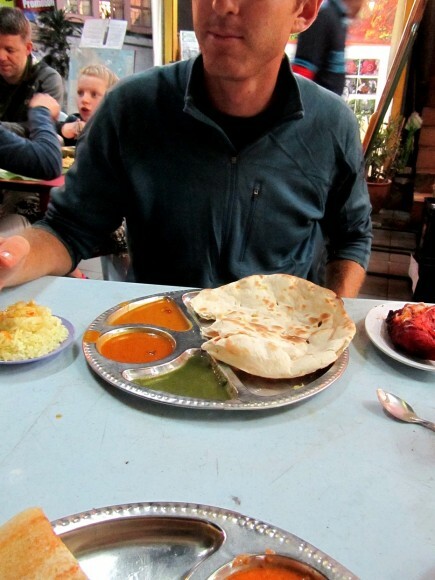 However most days we sought out the mamuk restaurants, and mostly consumed roti chanai and teh tarik; which are also two of the best known examples of mamuk cuisine. 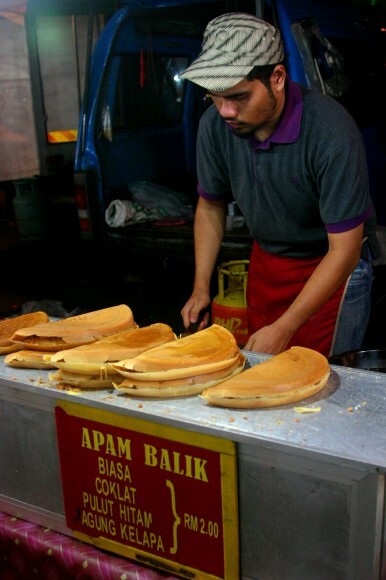 Clearly Indian in flavors and technique, yet only found in Malaysia, the roti chanai (meaning “knead” in malay) is a flaky flatbread made by continuously kneading, folding, oiling, tossing and finally cooking the dough on a griddle. Stretchy and flaky, it is served on a tholi, a circular metal tray, with a few sides of spicy chutney and perhaps lentils. Our favorite variation was roti pisang, made by folding bananas in the center of the dough and cooking; reminiscent of a banana pancake. While Brad loved the roti chanai, I opted for thosai, a bread made from a mixture of rice flour and black gram dhal, left to ferment overnight and then cooked on the griddle. As for teh tarek, (literally, pulled tea) it is made with condensed milk (here’s the Southeast Asia influence) and is poured back and forth between two containers; the higher the “pull”, the thicker the froth. It is an artist process, worth ordering the teh tarek if only to watch it being made. Equally popular establishments are kopitiams, traditional Malaysian Chinese coffee shops serving a variety of local coffee brews and Chinese cuisine. They range from upscale cafes to a small stand within a market place popping out sweet coffee drinks and juices. We visited the most well-known chain, Hailam Kopitiam one morning, started by the Goh family and popular in colonial times by the British and Negri Sembilan royalty. 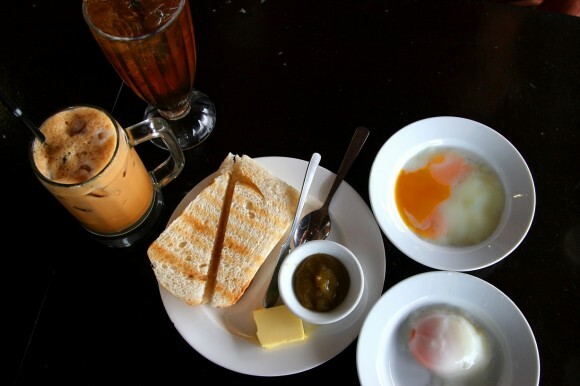 We ordered an iced coffee made with espresso, sweetened condensed milk and a traditional breakfast of soft boiled eggs and charcoal grilled toast served with butter and green kaya (jam made from coconut milk and eggs). 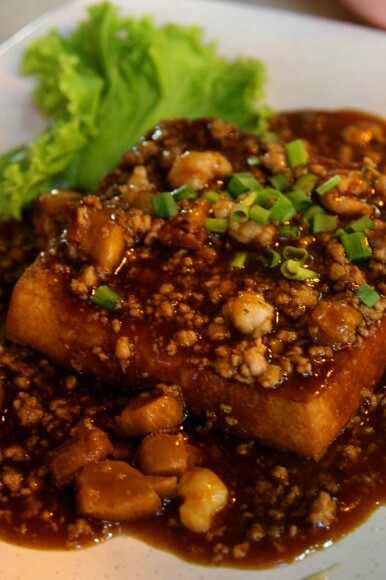 Hailam doesn’t just offer breakfast food, it is open all day and on another occasion I ordered tauhu goring, fried tofu served with a peanut sauce and bean sprouts. As for our go-to Malay food, it was the nasi (rice) dishes. Malay food is not Malay food without a healthy portion of noodles or rice. Ordering food without them is like ordering a sandwich without the bread. Seemingly boring, yet the combination of ingredients, flavors, and techniques make these dishes worth ordering time and time again. One hot afternoon I stopped by a small cart and pointed to an egg. It was all I wanted, yet before I could blink an eye, the vendor had made nasi lemak, twirling a piece of parchment paper into a cone shape, filling it with rice, fried peanuts, dried anchovies, a cucumber slice, a dollop of sambal (spicy paste), and a hardboiled egg on top. Like a lid, he folded the parchment down over the top. It was genius. Other nasi varieties we discovered through random finger pointing was nasi paprik and nasi USA. Some dishes we were only able to find once. These are the ones we savor over and over in our minds, appreciating their uniqueness and the luck in finding them. 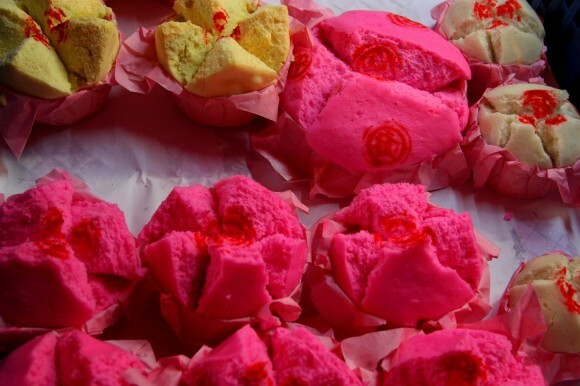 One particular experience was our encounter with lychee kang, ordered for us by no one other than the dreamer, Hairi. It was a drink meant to “cool the entire body”, and it was served in an oversized plastic cocktail glass; sugared water and crushed ice, which swam with fruit cocktail, lychee (a deliciously local translucent-white fleshy fruit) and peanuts. It was so strangely good; a perfect mix of soft and crunchy, sweet and salty. Another such experience was in Melaka, a beautiful city with a mix of intertwining cultures, heavy in Chinese and Dutch history and a former British territory. In the evening we were befriended by a local who directed us to a row of Chinese vendor stalls alongside the river, in search of popiah. In a game of hot and cold, we bounced between the various stalls until we found the infamous popiah, a raw spring roll, wrapped in paper thin crepe and filled with a green mix of jicama, bean sprouts, French beans, carrots, prawns and chopped peanuts, lettuce, and egg. 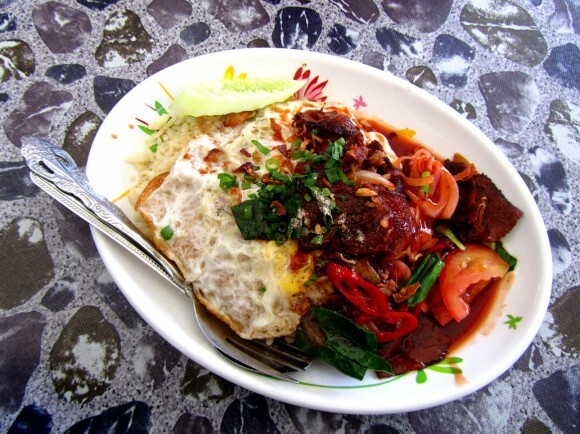 To drive through Malaysia is to blaze a trail from one great market stall meal to another. After sitting and watching the Muslim girls splash themselves with mud, observing the cats as they searched for lizards among boulder piles, and watching nature’s anomalous walking fish chasing each other across mud flats, it was time to discover yet another night market in search of dinner. So, at this particular market, what did we enjoy? We relished in one of Malaysia’s most famous contributions to the culinary world: satay; pieces of meat skewered on wooden sticks and barbecued over a charcoal fire, then brushed with a mixture of oil, honey, and spices. It was served alongside a spicy peanut dip, cucumber slices, and tightly packed cubes of sticky rice. From the communal tea kettle, we washed our sticky fingers and continued on. We finished off the evening with more sampling: pink fluffy muffins and apam balik; a crispy omelet style pancake oozing with crushed peanuts and chocolate. When our bellies were full, we strolled along the waterfront toward Nacho, said good night to the cats and to the walking fish. 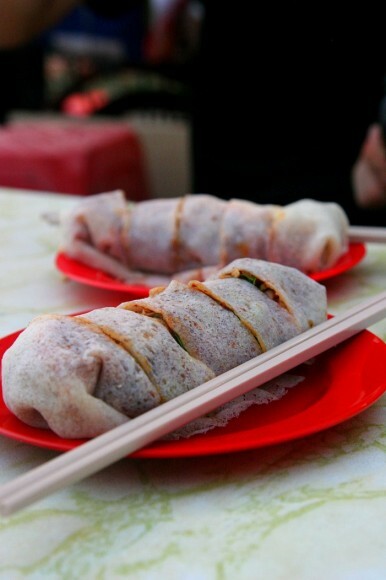 We would need our rest, because tomorrow there are more stops to be discovered on Malaysia’s food trail. How soon do you folks leave Malasia? I wonder – Is that fish on the mud the infamous asian snake head fish making its way across the eastern sea board? Thanks for the story and the pictures. Amazing fish story. Is this where Darwin meets his Maker?? ?